“The brands that elicited the most positive interactions did so through a combination of relevance, dynamic content and a strong call-to-action,” according to an analysis of the largest NFC out-of-home advertising trial to date. Outdoor media agency Kinetic Worldwide and out-of-home advertising giant JCDecaux have released the results of their landmark NFC advertising trial in the British town of Reading. 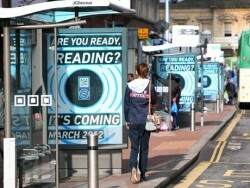 Launched in March 2012, the ‘Test the Near Future’ pilot was the world’s first large-scale deployment of NFC-enabled advertising media. All the bus shelters and outdoor advertising sites in the town, as well as all the posters in Reading’s main shopping centre, were equipped to support NFC and QR code interactions for the project. Advertisers who participated in the pilot included supermarket chain Morrisons, fashion retailer H&M, Universal DVD and Universal Special Projects, car maker Mercedes, TV channel ITV2, energy drink Lucozade Sport, games maker EA Games and Unilever’s Lynx, Toni & Guy, Magnum and Vaseline brands. Content at each poster site was updated regularly throughout the four-week project and, each week, different advertisers provided different content, including special offers, vouchers, games and music. The results show that more than 3,000 people in Reading scanned the poster sites during the trial — the equivalent of one million people if the project had been run nationally across the UK. Consumers were overwhelmingly positive (78%) about the experience, citing ease-of-use of NFC as key to the trial’s success. The brands that elicited the most positive interactions did so through a combination of relevance, dynamic content and a strong call-to-action. There were strong download conversion rates, including an average of 28% for video content, rising to a high of 49% when the content was new and previously unseen. Voucher redemptions were found to attract new customers, with activity highest where the poster site was in proximity to the store but also in the area around the university and right across the city. Voucher redemption rates increased across the four-week period as consumers became more familiar with the technology and the possible reward. One campaign yielded a redemption factor of 18%; the average across the trial was 7%. 87% of people with NFC-enabled phones said they are likely to repeat the experience. 80% of non-NFC phone owners said they would like to use it in the future. “The research amongst Reading’s smartphone users showed that the key to success was the relevance to the consumer and experiences that built upon an existing brand relationship,” say the project team.